Ubersense Golf App has become one of the best and most used apps for golf swing analysis and from the raves and reviews of users there’s no doubt that the Ubersense Golf App is the app that you should download if you want to improve your golf swing. Well, here are just some of the great things that users are saying about this popular app. A lof of users would have gladly paid $20 for this golf analysis app, but to the joy and continued surprise of many players and coaches, the Ubersense Golf App continues to be offered for free. More than just pictures, videos of actual golf swings are a great way to figure out what’s wrong with your swing and how you should improve it. Because being able to analyze swings are one of the main reasons why golfers (and instructors) download golfing apps, Ubersense Golf App has laid out a great set of tools for users along with being able to record videos of their swings. Along with being able to record your swing in HD using your smart phone, the Ubersense Golf App also made available to players and coaches a great set of drawing and annotating tools that will help improve player swings. 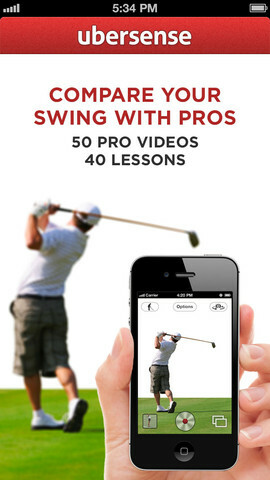 This free app also gives you a chance to record your own slow motion video of your swing, so you can improve every minute detail of your swing. If you’re going to make Ubersense Golf App your golf app of choice you’ll be introduced to a lot of other golfers and golf instructors. You can watch drills from professional coaches and even compare your swings with other players by sharing and watching your videos. With the Ubersense Golf App, you won’t be alone in your mission and drive to become a better golfer. If you’re an instructor and are looking for a better way to teach your students and improve their swings, then the Ubersense Golf App is certainly the app of choice for you. You can easily watch the videos your golfers upload and give them instructions even when you’re halfway around the world. With the Ubersense Golf App you can easily grow your audience and golfing base by connecting and linking with other golf players and golf instructors around the world. A picture paints a thousand words and videos can show a lot more, especially if you’re watching it in HD and reviewing it in slow motion. With the Ubersense Golf App you will be able to find out a lot about your swing and make the necessary improvements. And if you happened to forget, the Ubersense Golf App is free to download so there’s really no reason not to love this app. Find A Great Deal On Your Ubersense Golf App Right Here!